A few days ago, I was asked how I accomplished converting my Champion 40008 gasoline genset to run off of LPG, or propane. Rather than post this information on the existing 3,000 Watt Chinese Generator Info thread, it was agreed a new thread specifically covering LPG conversion should be started. Since the “Granddaddy Thread” had become so larger and diverse, containing literally hundreds of modification details, it is extremely cumbersome to find specific information within the three-yearlong running archives. What we are attempting to do here is keep the topic strictly to LPG conversion and not deviate into sound abatement enclosures, rewiring or who has what sale going on. By keeping it specific, we will have an archival reference source that can be easily accessed by both present and future members. My comments and experiences will hopefully be interspersed with questions and contributions from others detailing their own experiences with LPG conversion. The following article describes my method of converting a 6.5 HP, GX200 class gasoline engine, a GX390 class, and 10 HP Briggs & Stratton air cooled engine to run on propane (LPG). The methods in this article do not in any way imply compliance of the engine with EPA or CARB regulations after conversion. I cannot and do not warranty the safety, durability or success of the conversion. This article is intended ONLY to serve as a description of my steps to make a conversion on personally owned equipment and IS NOT intended as a step-by-step construction method for others to follow. Any and all alteration that may be performed to equipment owned by individuals reading this article is strictly performed at their own risk with no liability associated with the author. Now that my lawyer is happier with my disclaimer, let's get to the real "stuff". The common Chinese genset produces around 3,000 watts from a gasoline fueled engine that is basically identical to the popular Honda GX200. Gasoline carburetors used on the entire crop of Chinese gensets built around this engine are similar or the same in design. I am of the opinion that all of these engines are easily and inexpensively capable of being converted to run on LPG and still produce the same horsepower and wattage as they did on gasoline. For those who want a “turn key” system, US Carburetion, offers both low and high pressure kits to completely accomplish the conversion. They have overseen and/or preformed thousands of conversions and may be considered the "experts". Do not hesitate to consult their web pages for info as well. I was not afraid to do a little work myself and reused a regulaqtor cast off from an old burned out gas Bar-B-Q grill. I also outsourced/built some of my valves and connectors and modified, in some of my conversions, the existing gas carb into a LPG mixer. By doing so I cut my cost over purchasing a complete conversion kit by as much as 75%. I believe a little understanding of LPG is needed to safely accomplish the conversion. LPG is commonly stored in metal cylinders under pressure. Since LPG (propane) turns from a liquid to a gas at 44 degrees below zero (boiling temperature) the pressure in the tank is necessary to keep the gas in liquid form. The pressure right out of a propane cylinder will vary between 25 psi and 180 psi depending on ambient temperature. Some gas appliances are called “high pressure”. These may include portable propane camp stoves, ovens, grills lanterns and the common propane torch used to solder and heat metals. These systems do not use a regulator between the propane tank and appliance. Recreational vehicles use a low pressure propane system. To accomplish this pressure in the propane tanks is lowered via a regulator, usually attached at the tank, to no more than 10 psi. This pressure is consistent no matter what the outside temperature is. Internal combustion engines such as the ones on the Chinese gensets need an even lower LPG pressure system supplying around ½ psi. These engines also need a variable volume of fuel and air, depending on the speed and load of the engine. To control this variable load, a vacuum demand regulator is required between the system’s low pressure regulator and the engine. These secondary lower pressure regulators are available from sources such as US Carburetion for around $60 in US funds. The tank regulator from a defunct LPG grill may be recycled, or the gas line currently on the RV may be tapped for the low pressure (7 to 10 psi) source of fuel. If the RV gas supply is tapped, a cut-off valve between the supply and the demand regulator is needed. The OEM gasoline carburetor on the engine needs to be converted, or drilled, to work with LPG. 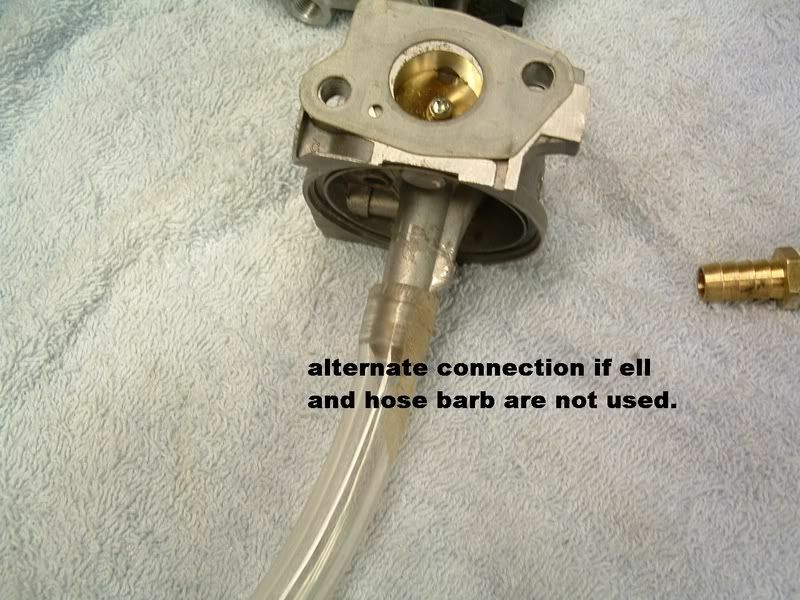 While dual fuel methods are possible, the simplest method is to just simply adapt the current carburetor. I decided to acquire a second carburetor to accomplish the conversion, leaving the original intact should I ever want to restore the engine to the original fuel. The second carburetor need not be from the same type of engine so long as the carburetor will fit the mounting studs. 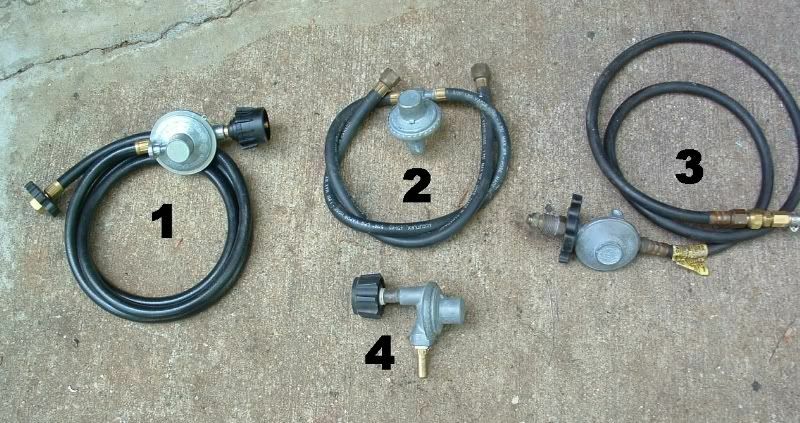 To accomplish the evolution from gasoline carburetor to propane mixer, the float bowl, float and needle are removed. The main jet in the center of the carburetor is also removed. These parts are discarded. I needed to make what is known as a “load block”. This is nothing more than a valve between the output of the demand regulator and the mixer. 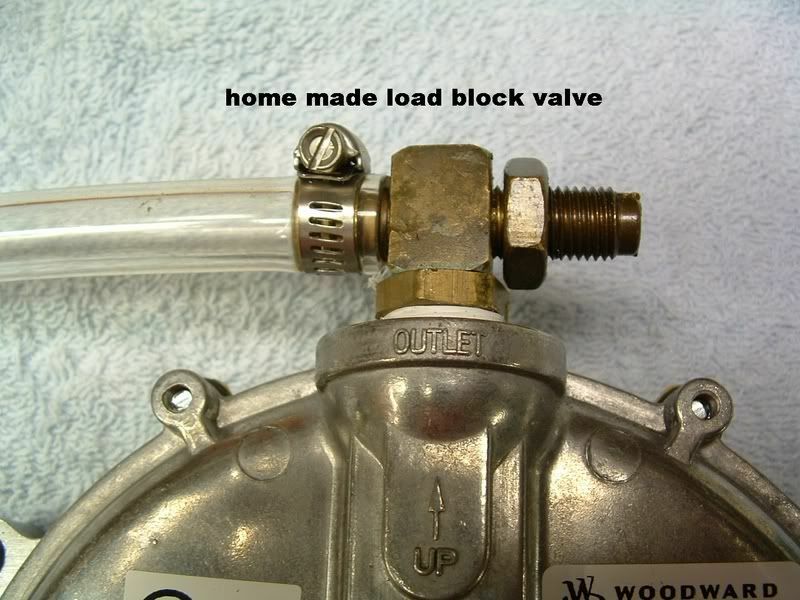 The load block may be a regular gas ball valve (about $8 for a 3/8” gas rated brass ball valve at Home Depot) or a home made adjustable restrictor using a brass “T”. Stay away from valves made for water. Water valves can easily leak a gas like propane. I selected to make the adjustable restrictor with a brass “T”. So far, this is what we have: A propane tank, a low pressure regulator attached to the propane tank (or the RV’s low pressure gas source), a “demand” regulator after the low pressure regulator. An adjustable “load block” coming out of the demand regulator which attaches via a hose to the input to the mixer. This photo is for "show only". The actual conversion uses LPG rated hoses and clamps. Professor Randy T. Agee & Nancy Agee. Also Oscar, the totally ruined Dachshund. 2009 Cedar Creek 5th Wheel - 2004 Volvo VNL670 class 8 MotorHome conversion as toter. Turbocharged, 12L, 465 HP and 1,800 ft. Lbs. of torque. Why consider a LPG Conversion? So, you have a perfectly good, gasoline fueled, air cooled portable genset. Why in the world would you want to hack it up (relatively speaking) to run off of Propane? These are some of the reasons that have recently been cited for making such a conversion. Unlike gasoline, LPG does not degrade over time. Therefore, you always have a fresh, clean, water free fuel source – even after months or years of storage. 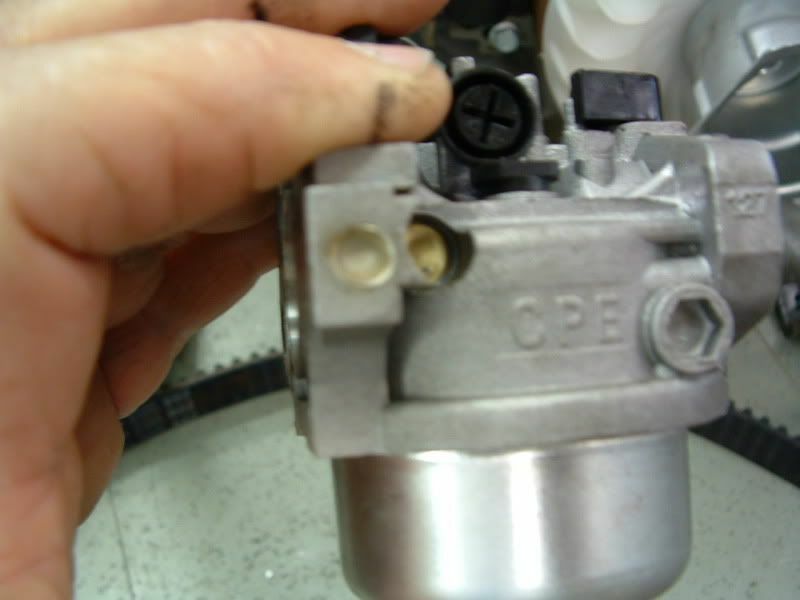 LPG will not evaporate from the carburetor fuel bowl and leave gummy residues to clog fuel jets like liquid gasoline. LPG burns cleaner – supposedly better for the environment. We do not pay high road or motor fuel taxes on LPG. Therefore, the cost per gallon is often lower than gasoline. If dedicating the genset to a 5th wheel or travel trailer, you do not need a new fuel source. The genset gas tank can be removed and the RV LPG supply used. When traveling, extra containers of gasoline are not needed. No slosh, spillage or evaporation. Also lower risk of fire compared to an atmospherically vented gas tank/container. The LPG fuel source can easily be 30 or more feet from the genset allowing diverse installation opportunities. For home back-up power use, large LPG tanks are available for long term power outages (my home tank is 300 gallons and buried in the back yard – my last fill up was $2.16 per gallon). LPG converted engines will also run off of natural gas, making them great for areas with gas mains in a power outage. Five gallon LPG exchange tanks are available at most home stores, convenience markets, Wal-Mart and gasoline stations. Most all larger campgrounds offer filling of larger LPG tanks. Converted gensets are easily externally readjusted to compensate for altitude variations. Contrary to some info, converted gensets DO NOT produce any less power than they did when burning gasoline. Many of the small air cooled engines can be easily and inexpensively converted to tri-fuel. These conversions will run off of gasoline, LPG or NG. My GX390 home backup genset is converted in this manner as was my previous B&S genset. A 5 gallon OPD style LPG tank will hold 4 gallons of liquid propane (now that’s a real oxymoron!). Enough fuel to run a typical GX200 class engine for over 24 continuous hours. Go here for more info on LPG. 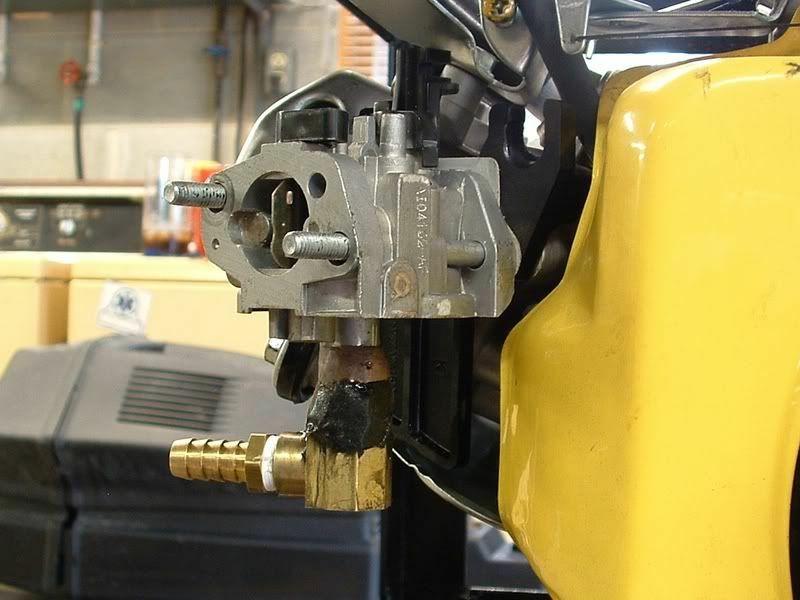 In Part 2 we are going to discuss converting a GX200 class air cooled gasoline engine to run exclusively on low pressure propane, as available from a RV supply line or a conventional Bar-B-Q propane tank using a tank regulator. Keep in mind as we explore this part of the conversion that there are actually two regulators used in this system. There is one at the propane tank that drops the tank pressure to 7-10 psi of line pressure that supplies a second regulator. The second regulator is often referred to as the intermediate regulator or vacuum feed regulator. It is this regulator that controls the amount of propane being fed to the engine. Unlike LPG tank pressure regulators, intermediate regulators are not easily found lying around and must be ordered from an authorized supplier. US Carburetion is one source for the Garretson KN Series Regulators (Woodward manufactures an almost identical regulator). You can purchase from them just the regulator for slightly less than $50, or order what is called the type "A" Kit with clamps, hose, load block and fittings for around $157. If you select just the regulator, you can locally outsource the other parts and perhaps save a significant amount of money without comprimising safety. These regulators are designed to work on engines that do not idle. Since the majority of Chinese built 3,000 watt class generators based on the GX200 engine are designed to maintain 3,600 RPM, these regulators are ideal. The KN regulator will follow varying load conditions from the engine and respond with the appropriate amount of LPG vapor. This would NOT be a good regulator for an engine that has an “eco-throttle” designed to bring the engine down to an idle when the load on the generator drops or ceases. 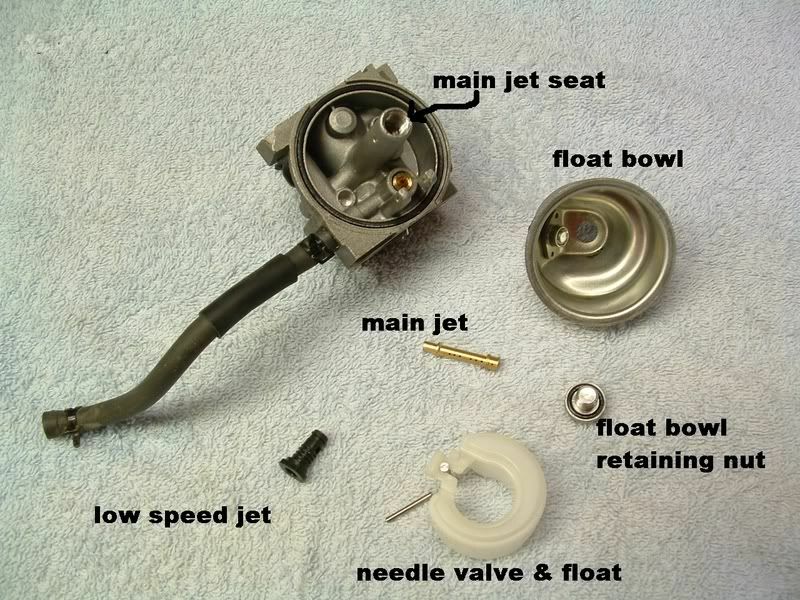 Taking a quick look at a conventional gasoline GX200 carburetor, we recognize that liquid fuel is retained in a float bowl at the bottom of the carburetor. 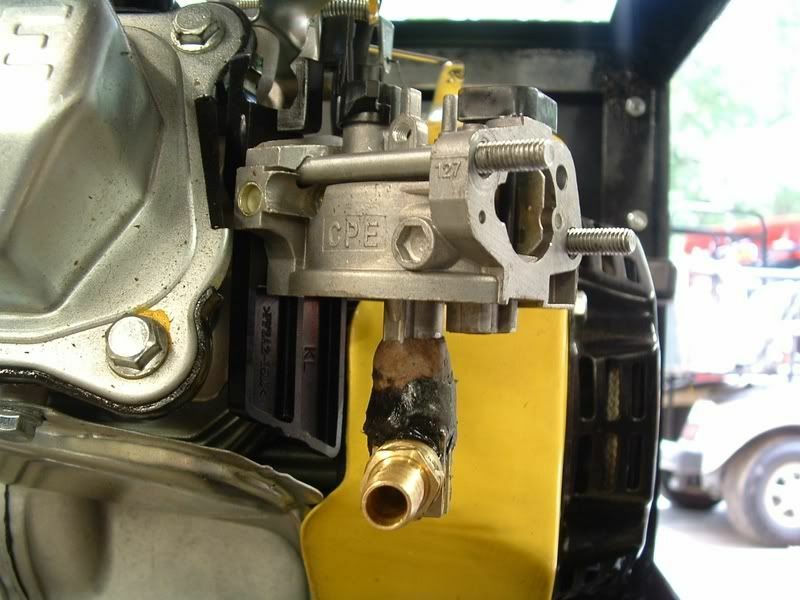 As air is drawn into the carburetor by the vacuum created inside the engine from an open intake valve and descending piston, a small amount of gasoline is siphoned out of the float bowl, through a main jet and into the engine. This siphoning is a result of the Venturi Effect associated with air flowing over a small tube inserted into the liquid gasoline bowl. 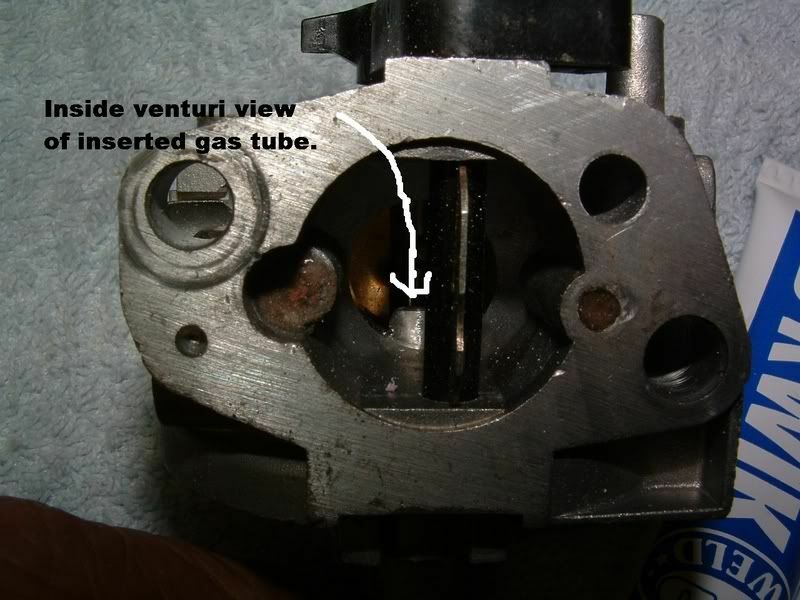 The photo below shows a carburetor venturi after modification for LPG, but the tube position is still in the same location as it was for gasoline. 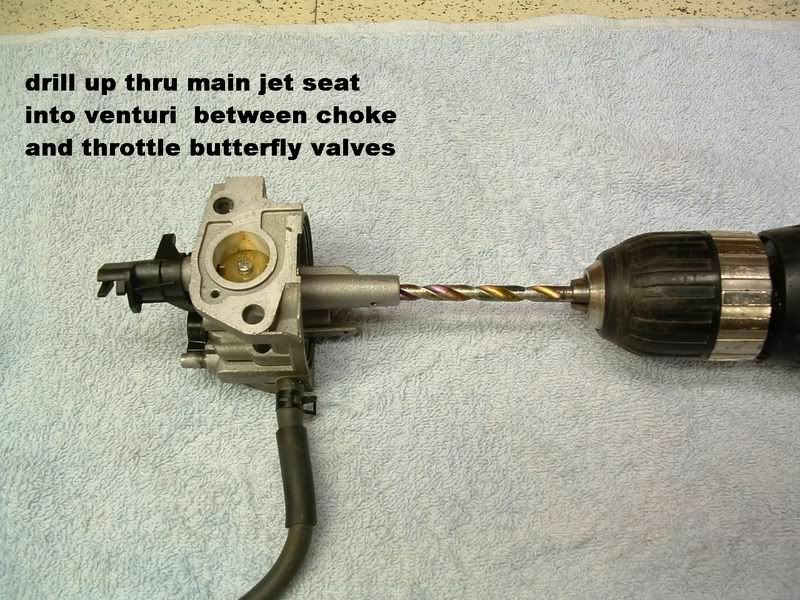 As air flow increases by opening the throttle butterfly, the lower pressure in the venturi increases the amount of gasoline drawn into the engine. Propane, unlike gasoline, is released to an engine’s fuel system in vapor form. Therefore, the conventional float bowl found on gasoline carburetors is not needed. Additionally, the flow of LPG vapors into the engine in this conversion must be externally regulated. This flow is controlled by the KN regulator as a result of the pressure differential in the venturi of a modified carburetor. The basic KN regulator comes with a ¾” pipe thread input fitting and a 3/8” thread output fitting. Adapters to fit the size of hose used can be made-up from black iron, nylon or brass fittings found in the plumbing section of a home store such as Lowe’s. Conventional fuel line gear clamps are used to secure the hoses (more on hoses later). The regulator needs to be mounted close to the existing carburetor and once again some simple brackets will need to be constructed from aluminum angle or flat bar stock. At the input of the regulator you will need a valve known as a load block. A simple in-line gas ball valve works well. Again, these are available at home stores for about $6.00. The one pictured was made from a brass “T” and stud to create a restrictor valve. The KN regulator will have a button in the center called a primer. Pressing the button supplies LPG vapor to the carburetor (actually, mixer in LPG systems) so the engine may be started. Think of it as the choke for LPG. 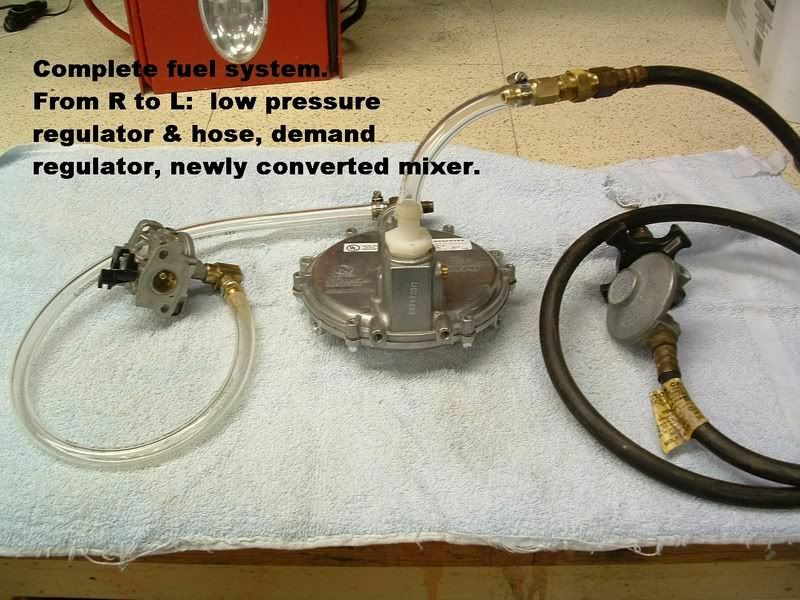 When I am able to write part 3, I will detail how to modify an existing GX200 gasoline carburetor into a mixer for LPG. Even though this thread is starting off more like a blog than a forum group, please feel free to post any questions or comments as needed. I, or some one else with similar interest and experience, will do our best to give answers. To begin the process of converting the existing gasoline carburetor from a small GX200 class Chinese genset engine, we first need to totally remove the carb from the engine. 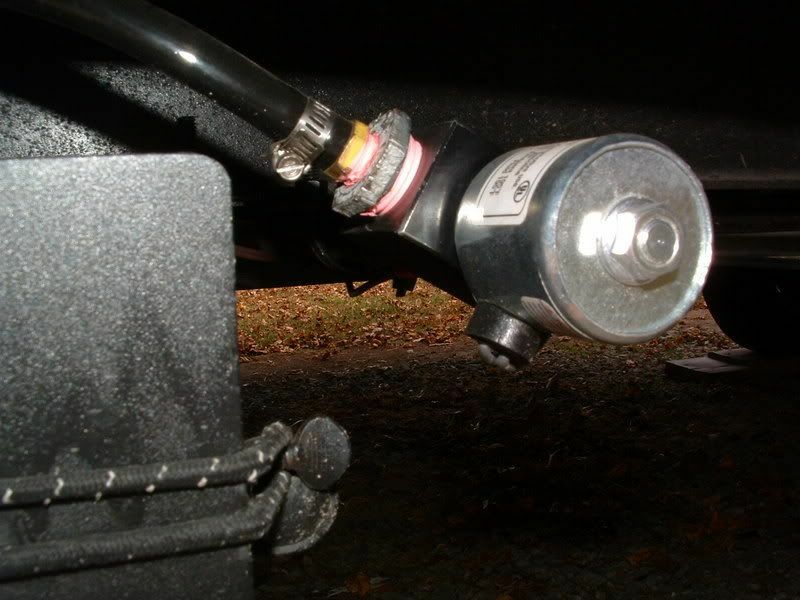 Start by removing the four bolts that hold on the gasoline fuel tank. Turn off the fuel petcock and completely remove the tank. Completely remove the air filter assembly. Closely note how the throttle linkage is attached to the carburetor and make a note of the placement of the throttle rod spring. These items will need to be returned to their exact original positions. Remove the two retaining nuts on the end of the carburetor, leaving the studs in the engine block. Slide the carburetor off the studs being careful not to tear the gaskets. If the gaskets stick, spray a little WD-40 to heavily coat them, wait a few minutes and they should gently release without damage. 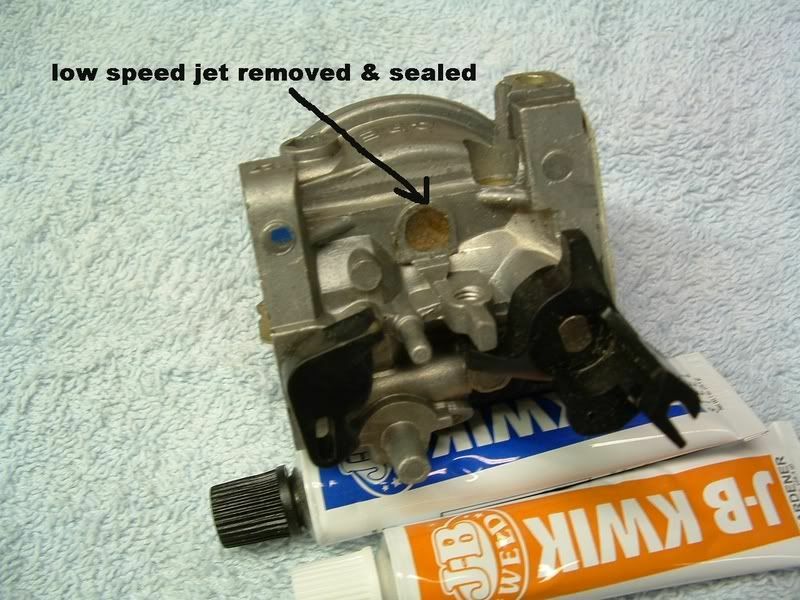 Lay the carburetor on an old towel or rag that you do not mind getting a little gasoline on. Completely disassemble the carburetor. 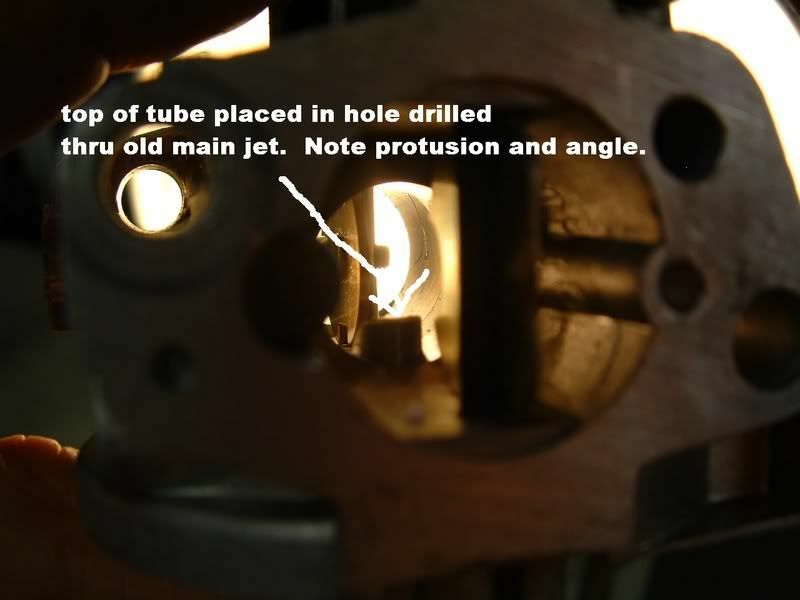 This includes using a small screwdriver to take the main jet out of the main jet seat. All of the parts you removed will not be reused. Put them in a plastic bag for a friend – he may need them one day . Carefully drill out the main jet tube. Carefully means keep your drilling slow and straight. 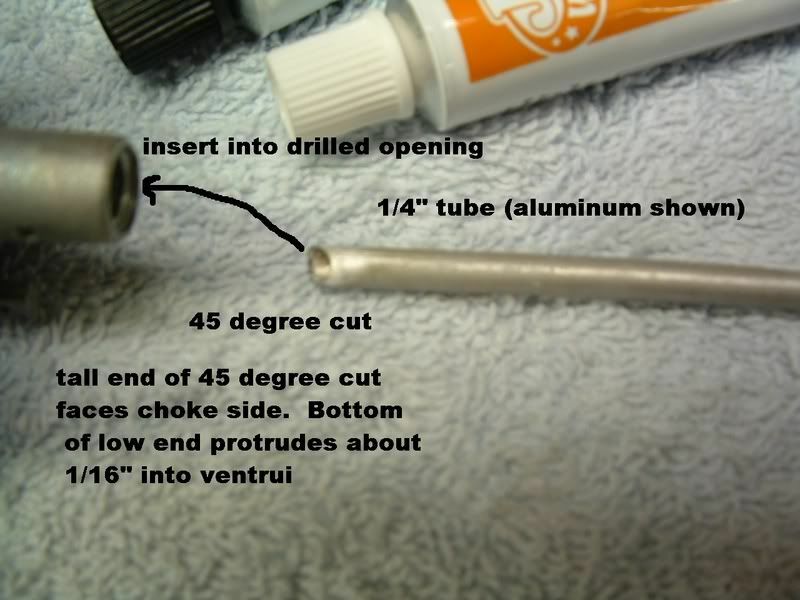 Use the spray carb cleaner to wash out the tube after drilling. Be sure to wear safety glasses when spraying. The end of your tube will need to be shaped so there is a 45 degree angle. Use your file and sandpaper to form the tube and clean off any rough edges. Clean the tube with spray carb cleaner after shaping. The tube is inserted into the drilled hole. Position the 45 degree slope so the lower part is facing the intake and the higher part is facing the engine. The lower part should just barely rise above the bottom of the venture of the carb. Mix up some JB Quick epoxy and glue the base of the tube to the main jet housing. DO NOT CUT OFF THE TUBE AS SHOWN IN THE PHOTO. Let it extend beyond the main jet housing until after the glue completely hardens. The glue will set in 10 minutes, but complete cure will take an additional several hours. Let it sit until the epoxy has cured. 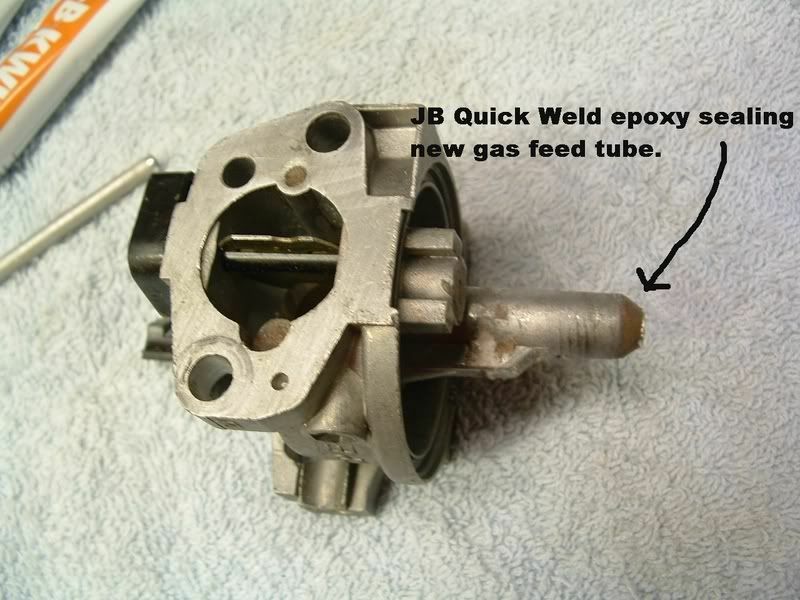 Fill the remaining low speed jet hole in the carb with epoxy. You have numerous options for the attachment of the LPG vapor tube that runs from the intermediate regulator. Two are shown below. You will note in the photos I am using a clear plastic tubing. We will talk more about supply lines and hoses in PART 4 so hold off on making any final connections. In PART 4 I will discuss the tank regulator selection, gas supply tubing selection, testing for leaks and starting the engine on LPG for the first time. I hope someone is reading this and finding it beneficial. It is sort of odd not to have any feedback or comments as the article develops. Anyway, one more part left to write for the GX200 dedicated conversion and if intrest is there, we can expand to tri-fuel options and different engines. If all of this do-it-yourslf stuff is too much, remember US Carb will sell a complete kit - even drill and convert your gas carb if you send it to them. They are the true pros, not me. I'm just a teacher and writer. Remember, just because it may seem like I know what I am talking about doesn't necessarily mean that I do! About the only thing left to accomplish with our conversion of a GX200 class air cooled, gasoline engine to run off of LPG is the hose and high pressure regulator. High pressure regulators attach to the bulk LPG or propane tank. These tanks are usually 5 gallon, or 20# portable and refillable tanks commonly called “gas grill tanks”. Of course, larger tanks such as the 7.5 gallon, 30# size are often found on recreation vehicles. Unfortunately, these tanks are not readily available as “exchange” tanks. Some LPG appliances are known as high pressure and do not use a regulator at the tank. Small portable gas grills, lanterns, catalytic heaters, and camp stoves are all examples of appliances that work directly off of high pressure LPG supplies. All of the appliances inside of a RV are LOW PRESSURE. Additionally, larger propane gas grills that are often used at home are most likely to be low pressure. These appliances will have a high pressure regulator that attaches directly to the tank. (The output from the regulator will be low pressure.) The exception is the RV that usually has double bulk tanks and uses a short pigtail hose to attach the tank(s) to a single regulator. Motor homes may have non-removable LPG tanks with a different style of regulator. Bar-B-Q gas grill regulators are universally single stage regulators. They are factory adjusted to supply no more that 12 PSI of vapor at the output of the regulator – no matter how high the tank pressure may be. RV regulators are often two stage regulators and may even have an automatic tank switch over that will exchange tanks when the pressure in one drops below a predetermined level. Even with the extra regulation stage and automatic switch over, these regulators still supply no more than 12 PSI of vapor to the output. Most new regulators have an OPD (overfill protection device) fitting attached to the tank end. These fittings screw onto the outside threads of the tank valve. Older style regulators have POL (put-on-left) brass fittings that screw inside the threads of the tank valve. These fittings are tightened with a 7/8” wrench. New mandated OPD tanks will accept either OPD or POL fillings, making the older style regulators useable (but not as convenient). High pressure regulators recycled from cast off propane gas grills will work well for a small engine LPG conversion. The type that offers the best versatility will have a removable hose fitting on the outlet side. Those that have a pressed fitting will be more difficult to work with. Avoid repurposed regulators that have two outlets..
Of course, new regulators with tank fittings can be purchased for approximately $25 at home stores or Wal-Mart. You may need to purchase the hose as a separate item. #1 – OPD tank fitting, 8 foot long 5/16” LPG rated hose with ¼” NPT female fitting on hose end. This is a good regulator but you cannot easily change hoses due to the crimp connection at the regulator and a fitting that is not removable. 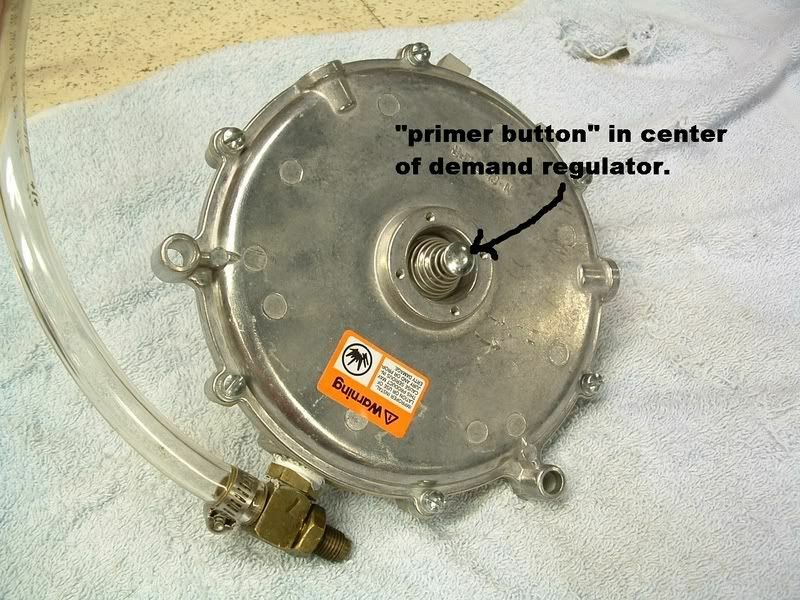 #2 – This regulator needs a tank fitting. It also has a “T” screwed into the output with two hoses. Cost of a new tank fitting and a single output fitting with a supply hose make this regulator undesirable – keep looking. #3 – Has the old style POL tank fitting, but it will attach to new OPD tanks so this is OK. 6 foot 5/16” LPG rated hose with ¼” NPT female on end. A good regulator for a LPG conversion. #4 – Another good regulator. Has OPD tank fitting and a barbed fitting for a hose connection at the outlet. This would be nice for making up a longer feed hose. Feed hoses from the high pressure regulator longer than 8 feet really should be ½” inside diameter rather than 5/16” – which is standard on Bar-B-Q grills. The following web site will give you detail for hose sizes per kW of generator output. Brass fittings, gear clamps and adapters can often be sourced locally at Lowe’s or Northern Tools. You are possibly wondering if you really need LPG rated hose. I cannot tell you yes or no, but I can give you some info that will possibly help with your decision. LPG is less corrosive or prone to damaging the delivery hose than regular unleaded gasoline. LPG pressures after the high pressure regulator are under 15 PSI. Hoses designed for unleaded gas on fuel injection vehicles typically operate at 60 PSI. So does this imply that less expensive and readily available fuel hose designed for unleaded gasoline and fuel injection is a safe substitute for LPG certified hose? I elected to use UL certified LPG hose for my applications, even if it was considerably more expensive. I did use some lesser rated hose while testing different systems and set-ups. Once all your connections are made from the tank to the high pressure regulator, and from the output of the high pressure regulator to the demand regulator, and from the output of the demand regulator to the modified carburetor (LPG Mixer), you are ready to conduct your pre-flight test. SLOWLY turn on the LPG tank valve. Why slowly? Well, OPD tanks have a valve inside that will close off the vapor supply if the flow exceeds a specified level. On a dry hose start up, if you quickly open the tank valve, you run the risk of no flow. This is true for any OPD tank and appliance – including your RV. Check carefully for leaks. You can use a 50:50 solution of dishwashing detergent and water in a spray bottle or you can go to the dollar store and get a big bottle of kid’s bubble blowing soap. Spray all connections and fittings and watch for bubbles to form. If you have a leak, fix it. If not, the next step is “take- off”. With the load block about ½ open, press the prime valve on the regulator for about 2 seconds. You can hear the gas flow. When the engine starts, it may run rough or stall. Adjust the load block until the engine runs smoothly. If you change altitude, you may need to readjust the load block – otherwise there is no need to readjust. To shut down the engine, the preferred method is to cut off the LPG gas supply rather than flip the kill switch. You can do this at the tank, or an optional cut off valve. For the LPG generator I have on my RV, which draws fuel from the RV’s LPG high pressure regulator and supply lines, I have a 12 VDC gas solenoid valve that shuts off the vapor supply to the demand regulator. You should now have a clean(er) burning engine with no wet fuel to wash oil from the cylinders, cleaner crankcase oil and a fuel with a long term storage ability that is always ready to go when you need it. I guess our next discussion will be how to convert engines other than the GX200 class and options for tri-fuel operation. I currently have the tri-fuel option on my GX390 class engine spinning a 7,500 watt generator for my home back-up system. Your students learn what you teach them, don't they? The ones that take the time to come to class do. Unfortunately, too many believe attendance is not necessary. I have a Zongshen 13hp 9kw that we bought at Pep-Boys as a back up unit for the house. As we are very rural, it is not uncommon for us to lose power for 12-14 hours at a time. This is a bummer in -10 nights. We did the Conversion, and noticed it ran quiter, used less fuel, and the exhaust EGT's dropped. To top it off, the oil stays clean, and the valves seem to hold adjustment longer. We can run off a 100lb tank for over 30 hours now. We always have our tanks filled to 24 gallons to avoid issues when the temp drops or rises. That works out to .8 gallons an hour vs the 1.1 on gasoline. Plus propane is 2.49 a gallon vs 3.69 for gas, and it stores easier. I figured I am able to dial the mixture in better to compensate for our altitude (6280'). Why manufactures dont offer morepropane gennies I will never understand. I would have gladly paid $100 more for the Propane genny vs the Gasser..
GREAT write up. Reminds me of all the fun I had when I did ours.. Takes the fear out of anyone who is intrested in doing it!! Very well done write up, and nice job on the conversion. However, Onan states that their 4.0 genset is derated to 3.8 KW when fueled by propane. General rule of thumb, they say, is a 10% reduction in maximum output. Propane conversions can produce the same power as with gasoline. However there is no free lunch, as they say. To get the same max output, I find I have to burn slightly more propane than I would gasoline. For a given period of time at a given load, if it takes 100 gallons of gasoline, with propane I will use approx 110 gallons. Still by far cheaper to buy 110 gal of propane than to buy 100 gal of gasoline. Here in Stuart Florida, currently, 110 gal of propane costs $247.50 and 100 gal of gasoline is about $365, a saving of over $100. During the last 3 hurricanes here in south Florida, Francis, Jean and Wilma, we were without power for about 10 days each. I put about 240 hours on my generators with each storm, so for me, propane is the best way to go. I find it easy to store and have available to use. On the ranch in Oklahoma where I grew up much of our equipment, trucks, tractors, pumps, etc. were propane fueled, mainly due to the price difference with gasoline or diesel. It is a great all around fuel IMHO. Thank you for your time and effort on your conversion article! I have a real GX200. Due to a very poor experience with US Carbs, I ran my generator with natural gas, thru a ball valve no regulator, for 36 hours during Hurricane Gustov. I fired up on gasoline then switched over to NG after load stabilized for two freezers and lights / fans. This worked fine but must be attended to for obvious safety violations. The GX200 loves NG but with far lower BTU than propane/gasoline, I would think that de-rating of maximum wattage would be in order. When I acquire a proper set up I’ll load test NG/gasoline. Anyone wanting a Type C Tri-Fuel Natural Gas, Propane, and Gasoline Kit $187.00 for the (genuine) GX200, save your money. The kit will not allow you to re-fit stock air cleaner with choke keeper assembly. I ate nearly $30 in shipping cost which I could have put to a second carburetor. Of course, the kit may (?) work fine for the clones as your air filter appears to be a different configuration. 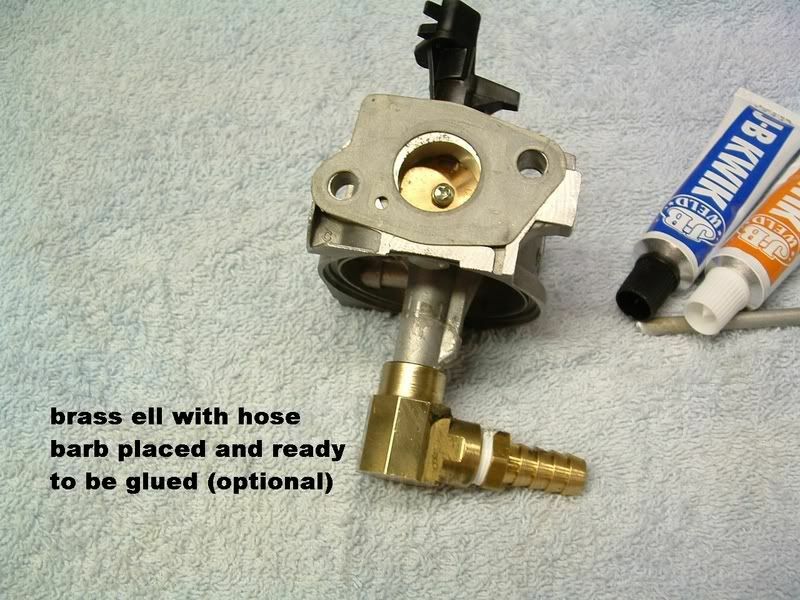 I found a source for $36 carburetors, clones; http://www.psep.biz/store/honda_small_engine_carburetor_complete.htm#S520718 that will allow me to set up a carburetor along the lines of your article. I would love to go a tri-fuel set up but don't want to give up the stock air cleaner/gas carburetor. A retrofit venturi adapter may end up costing as much as a clone carburetor?